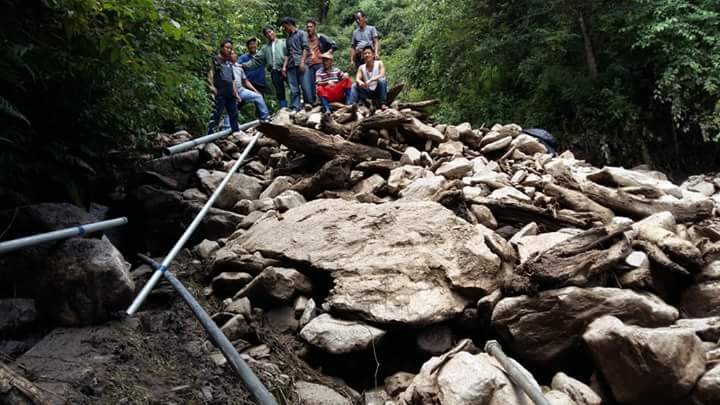 A cloudburst in Arunachal Pradesh’s Lumla area of Tawang district on Monday has severely damaged various water supply sources rendering the region in deep shortage of drinking water. However, no casualties have been reported so far. Water supply structures like headworks and pre-sedimentation tanks at all the nine water taping points (WTP) of three stream sources in the region have been destroyed beyond repair while the turbulent streams have washed away various structures and GI pipes used for water supply and they are reportedly untraceable. Lumla is around 455 kms from here. The three stream sources–FC Nallah, Mangnam Nallah and Dobley Gonpa–are the prime source of water supply for Lumla Township and Kharteng village. The Lumla headquarters, Manpat bazaar, Mangnam, Dolma Lakhang, Moyu, officer’s colony and Kharteng village are the worst affected. “Temporary restoration works are on in war footing despite minimum available resources in the sub-division. However, for a permanent restoration and complete rectification, the government aid is highly sought,” said PHE and Water Supply assistant engineer, Tumba Ingo. “The department at present is unable to provide potable water to the consumers of Lumla, its periphery and at Kharteng village as our WTP remains cut off from all the feeder sources. Water tankers have been engaged for supplying water to colonies and villages with assistance from the GREF,” Ingo said. The Lumla additional district magistrate has been appraised about the calamity and a detailed report of the damages estimated at Rs 2 crore (approx) has been submitted by the water supply department. Meanwhile, drought like situation has severely affected the paddy fields in the Ruksin block of the state’s East Siang district. Due to acute water scarcity, various irrigation projects and crops have completely withered adding more to the worries of the crisis ridden farm sector in the region. Local MLA Tatung Jamoh who carried out an inspection of the area on Tuesday interacted with the farmers and village elders and assured them that he would apprise the state government and department concerned about the crisis.